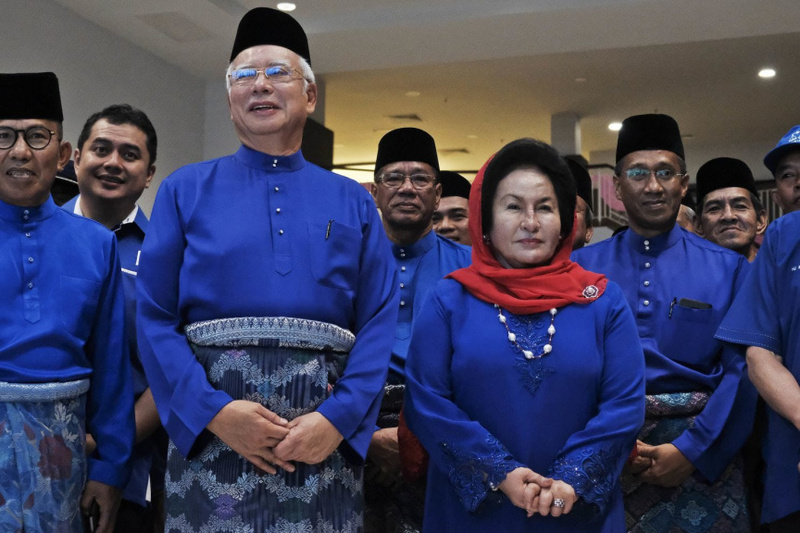 KUALA LUMPUR, Malaysia (AP) — The wife of former Malaysian Prime Minister Najib Razak has slammed police raids on their properties, saying Saturday they appeared targeted at vilifying the family to provoke public anger. In her first statement since Najib's long-ruling coalition was ousted in May 9 elections, Rosmah Mansor said authorities conducting a corruption and money-laundering investigation should avoid a "premature public trial" of her family. Thousands of Malaysians followed a livestream on social media of Thursday night's raid at a Kuala Lumpur condominium, where police confiscated 284 luxurious Hermes Birkin handbags and 72 suitcases filled with cash, jewelry and other valuable items. Rosmah said the family will cooperate in the investigation into the 1MDB state investment fund, but that authorities should not "be feeding social media trolls." "It is our hope that the authorities would observe the rule of law and due process, to avoid a premature public trial," she said in a statement released through her law firm. Rosmah was reviled by many Malaysians as an avaricious first lady who loves Birkin bags and leads an opulent lifestyle, but television footage of the police haul has Malaysia gasping with shock. It is possibly the most sensational image of elite corruption in Asia in the three decades since former Philippine first lady Imelda Marcos and her infamous collection of designer shoes. Najib started 1MDB in 2009, but the fund accumulated billions in debts and is being investigated abroad. U.S. investigators say Najib's associates stole and laundered $4.5 billion from the fund, some of which also landed in Najib's bank account, and that some $23 million was used to buy a rare diamond pink necklace for Rosmah. Najib denies any wrongdoing. New Prime Minister Mahathir Mohamad reopened a probe into 1MDB after a stunning victory in this month's polls that led to the first change of power since independence from Britain in 1957. Mahathir, 92, was prime minister for 22 years until 2003 but emerged from retirement to join hands with former political foes amid anger over the 1MDB scandal. Najib and Rosmah have been barred from leaving Malaysia. The government has also told the current attorney general, who cleared Najib of wrongdoing in 2016, to go on leave, and has relieved the country's treasury chief, who is also the 1MDB chairman. Malaysia's Anti-Corruption Commission has summoned Najib for questioning on Tuesday over the 1MDB case. Najib slammed the police raids as "irresponsible and cavalier," his lawyer Harpal Singh Grewal said Saturday. He declined to comment about the Birkin bags and luggage seized. He said police took personal belongings such as cellphones, iPads, clothing and baby shoes from two of the three apartments at the condominium that were raided and occupied by two of Najib's children, Singh said. He said there was "no relevance and no prima facie evidence for this seizure to take place." "Ex-Malaysian PM abused his 'absolute power'"